A truly exceptional lady, Pat Smallwood FBHS, who died in 1998 left a legacy to many current instructors and trainers within the BHS and the equestrian industry. Pat, or Miss Smallwood as she was usually called, owned Radnage House Riding School. This was run as a successful commercial family business, but there was much more to Pat Smallwood and Radnage than met the eye. She was very interested and involved in all sections of the equestrian world and once Pat became interested in something she became involved in it. There are two examples which I can remember clearly. The first occasion involved the Pony Club when Pat asked my opinion of the PC ‘A’ test. At that time I was a Pony Club branch Chief Instructor and trained and examined candidates for the ‘A’ test. The exam format included an initial assessment of riding the horses outside. Should a candidate fail this section, then they were not permitted to ride in the Dressage section in the afternoon. Pat was against this and wanted to change the approach and allow the candidates to sit the Dressage section regardless of the outcome of riding outside. I was in total agreement with this as well, in order that the candidates would know where they were in their overall competence at this level. Historically, this subject had been taken off the PC Conference when Pat brought it up again. The Chairman said she would consider the point . . . when Pat said very politely, but very determinedly, that it had been under consideration for five years and needed changing now – and the chairman agreed! From that point on, the PC ‘A’ test ran as Pat Smallwood had suggested. Secondly, Radnage was an excellent centre for Riding for the Disabled (RDA). Many of the established BHS Instructors (Gill Watson FBHS, myself and many others) taught in the groups throughout the country, although many of the group instructors held no formal qualifications. At this time the RDA Association was expanding rapidly. Several of us (Jane Wykeham Musgrave, myself and Pat among them) formulated the RDA Group Instructor qualification and later, the RDA Instructor Qualification. These embedded part of the BHS Intermediate Instructor exam into the standard. Through the development and instigation of these training qualifications the RDA would probably not be where it is now without Pat Smallwood’s foresight. She was also interested in developing and supporting her staff and pupils. She wanted from them the best they could give and achieve. She would help anyone, but woe betide those who thought they were better than they were! Taking an exam without Pat saying that you were good enough was unwise. When Pat asked “When are you going to take the BHSI” (or any other exam), meant that only then were you considered to be ready. Gill Watson (team trainer for the Junior and Young Rider British Eventing Teams) was Chief Instructor at Radnage. Pat never bragged about the Eventing successes of Gill, but she was so proud. I’m sure she looks down on us and cherishes the continued successes of Gill as coach, particularly for her amazing successes with the GBR Junior and Young Rider teams over many years. Unfortunately, Pat didn’t have a long and happy retirement. She moved to Gloucestershire with her family, and soon after contracted cancer. She died in January 1998 but left money to be given as an annual award to a hard working, destitute Instructor really keen to progress. You can probably guess the type of person she would want the award to go to. Not those with support and backing from family or sponsors; not to those having great success in the competition world; but to those working their socks off in the industry that are poor but enthusiastic and keen to gain experience and qualifications in order to help their pupils achieve. In 1988 The Pat Smallwood Award was set up and administered by six trustees. The money would have run out years ago, but additional funding was donated from Pat’s clients who donated more, boosting the initial amount. Pat’s generosity was contagious as other Instructors delivered their own training days donated their fees to the fund. One person ran the London marathon to raise funding, while the Fellows and Instructors Association (F&I) added to the pot for many years, and so kept the award alive. In 2008 the Trustees agreed to wind up the Pat Smallwood Award and in 2009 six recipients received an equal share of the remaining money. The award had been running for more than 22 years (there were two years when no suitable nominations were received, so the Award was not given). In addition to the financial benefits that the Award brought to a recipient, was a beautiful horse’s head sculpture designed by Jo Knowles FBHS. This is still awarded annually through the F&I Association and is presented to an Instructor who has put exceptional effort into the Equestrian Industry in a voluntary capacity. The following is my attempt with the help of others, to list the history of the Association. The name has been shortened to the F & I Association, but at its inception the full name was as the heading above, which should be used for all official documents pertaining to the Association. The Association was the brainwave of Pat Smallwood FBHS and Barbara Slane Fleming FBHS in 1986. At that time there were very few conferences, or study days for instructors of BHSI and FBHS level. The one that was an annual event in the Whitbread Room at Stoneleigh was the BHS Training & Examinations Study Day, which was “by Invitation only”. It was valuable but only a limited number of Instructors were invited. The conception of the F & I Assn. brought many excellent study days and training opportunities in the form of riding, observing and discussion to all Fellows and Instructors of the BHS. The hard work that has been put in to the success of the Association by the Chairmen, Secretaries/Treasurers and committee members has been immense. Without them the Association would not have survived and continue to be such a success. The number of training courses, study days, conventions, etc. that are now available through the BHS, BD, BE, Vets, Studs, Biomechanics Specialists and even interactive lectures on line etc. that are available in 2013 and have been for the last 8 or so years, has limited the members attending F&I days. The Annual Riding Course is still almost always fully booked and many observers attend and gain from the experience. Both Dressage and Jumping is covered and the course runs for two days in January. The Annual AGM and Dinner takes place on the first evening of the course. There is always a great atmosphere at the dinner with lots of “ catching up” by members and some form of entertainment or an after dinner speaker. Ann Bostock BHSI has been responsible for running the successful riding courses for years. The committee arranges suitable study days and visits to studs and training yards. Several years ago, Patrick Print FBHS when Chairman of the BHS Trustees arranged for the F & I Assn. to use the BHS stand at the International Horse Show (Hickstead), on the Saturday, which has become an annual event and is a great social meeting for members. Some events are listed as open, which means that a Member may take a guest(s) with them. The program is available on the Association of Fellows and Instructors website, and on the F&I Assn. Facebook page, however this is only available to the Associations membership. We are very grateful to Pat Smallwood and Barbara Slane Fleming for their brainwave. The first Chairman was Barbara Slane Fleming FBHS and Pat Smallwood FBHS was the first Secretary /Treasurer. The committee was formed of Marie Stokes FBHS, Pammy Sivewright (now Hutton) FBHS, Sue Payne FBHS, Islay Auty BHSI and Alec Lyall BHSI. At the first AGM on 8th December 1986, there were 36 Fellows and BHSI’s present with apologies from 20 others. The committee remained the same with Pat Smallwood staying on the committee. There was a slight mistake, as the Committee was not voted in at the AGM! In a handwritten letter to members, the Chairman apologises for that and says, “ You either have no committee and therefore no Association or we go on as we are! “ –so we did! Nowadays it would be serious sin. Thank goodness for some common sense! It was also noted in the letter that the annual subscription had been raised to £5 at the AGM and members not paid up by Feb 10th 1987 would not receive further communications. 1998 In January Pat Smallwood died. She left a legacy to be used as a Training Fund for destitute instructors wanting to further their careers. The Pat Smallwood Training Award was formed, which will be covered separately to this history in a later edition of British Horse. On Dec 12th 1988 at the AGM Barbara Slane Fleming retired as Chairman as she was finding the journey from Northumberland increasingly difficult, so was not able to attend all the days run by the Association which she felt a Chairman should do. Sue Payne gave a vote of thanks to Barbara and she was presented with two tickets for Phantom of the Opera and a basket of flowers. A proposal was put forward to elect Barbara Slane Fleming FBHS as President of the Association and the vote was unanimous. The Chairman in her report congratulated two Fellows and one BHSI who represented G.B. in our Olympic teams: Jennie Loriston-Clarke, Tricia Gardiner, and Ian Stark. Trainers of members of our Olympic team who are also Fellows or BHSI’s were Bill Noble, Paul Fielder, Pat Manning, Jane Bartle-Wilson and myself (Barbara Slane Fleming). The Chairman also congratulated Gill Watson FBHS on her continuing success with the GB Junior and Young Rider teams. As Chairman I had prepared to present my first report and chair The AGM. I had to ring Barbara Slane Fleming to deliver my report and Chair the meeting as a Court case at The Royal Courts of Justice for which I was an expert witness, over-ran by many days and I had to be there! Our President kindly stood in for me. 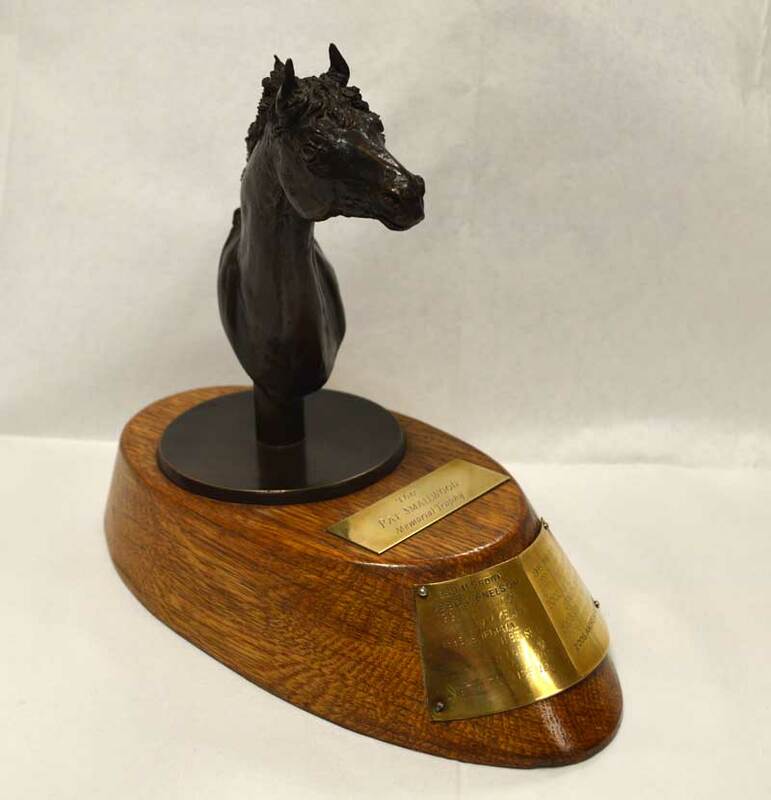 Jo Knowles FBHS presented a beautiful bronze of a horse’s head that she had designed and made to be presented annually to the winner of the Pat Smallwood award each year. A video library had been set up in 1987 with videos given by members or purchased by the F & I Assn. Members could borrow a video from the library from a meeting or they could be posted. We had videos such as the set by Klimke, two by Gill Watson on jump training, a set by Kyra Kyrkland, The Galloping horse (who appeared to have rubber legs), Maria Gunter’s training the Dressage Horse, and many others. Paul Ingram BHSI and Sue Payne organised the library, which was very popular particularly in the winter months. When funds allowed new videos were added. Unfortunately on ordering a new video for the library I was told by Alistair Martin Bird who ran Equestrian Vision a distributor of videos that we were not allowed to run the library as it could restrict suppliers’ sales. He was very nice about it but we had to gradually wind up the library, rather than get into much trouble! 55 members were present at the AGM. The original byelaws of the Association were amended at the AGM. At several AGM’s a foreign visit was suggested for a group of F & I members. It was always enthusiastically accepted but to my knowledge never got off the ground. Several members now attend the Global Forum, and the Verden Sales were very popular with several members but I do not think we have ever had an F& I Assn. official foreign trip. Many events took place Annually. Talland was very generous in running an Annual day where members rode the Advanced horses under the beady eyes of Pammy Hutton or Molly Sivewright FBHS, which was followed by discussion. The takings from these days were donated to the Pat Smallwood fund. Kenneth Clawson also donated money from his training days to the fund. Malcolm Brown ran the London marathon one year with sponsorship to the PS fund, with many others who contributed. A competition was run to design a logo for the F & I Assn sometime in the 90’s. Sally Newcome BHSI won and this excellent Logo is still being used on all official paperwork. Sally has also run the F & I website over many years. Over the years the Study Days have been very valuable. Always organised once a year and sometimes twice. Warwickshire College kindly gave us a room without charge. Or should we thank Pippa! ?